We did a little Valentine's Day-themed mug rug swap at my last quilt guild meeting. I made one and then wanted to make another . . . and another . . . and another . . . People, my place is lousy with mug rugs right now! My second one was this little guy. I used this tutorial from Pile of Fabric to make the Xs, and just figured out the "o" so it was the same size. I made two more mug rugs just like it to send to some friends who I thought needed a little quilty happy mail. I know it's been forever since I wrote, but that doesn't mean I haven't been sewing! First on the docket after the Christmas holidays was to work on my Riley Blake fabric challenge quilt, hosted by the Modern Quilt Guild. 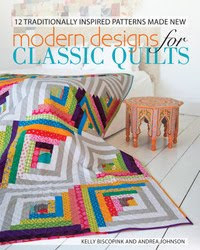 The lovely folks at Riley Blake sent a selection of stash-builder prints to participating Modern Quilt Guilds. Members could use the fabric to make anything they wanted, but could only add other Riley Blake fabrics and/or solids. 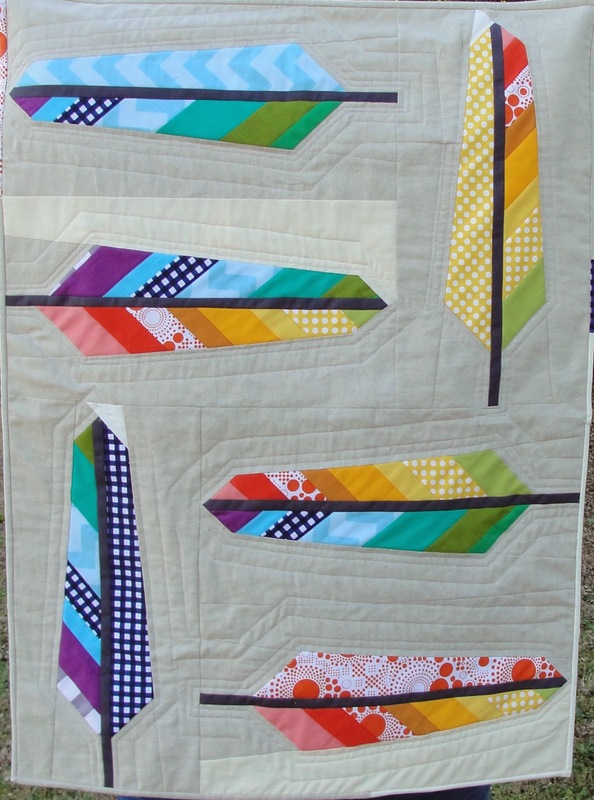 I'm sure you've been seeing the Anna Maria Horner "Feather Quilt" floating around the interwebs. It's super gorgeous, and I'd been wanting to make a few feathers for awhile. 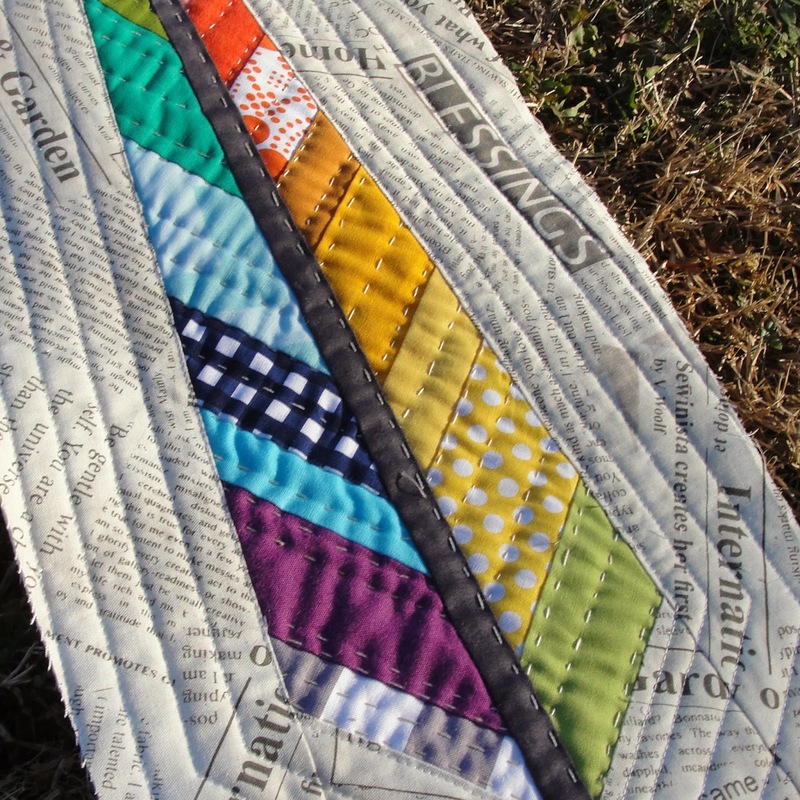 I decided to use my RB fabric, a bunch of solids to fill out the rainbow color scheme, and several linen/white/cream background fabrics to make a small feather quilt for my challenge entry. I made an extra block and used this Collage print as the background to make a little quilted pressie for my BFF. I've never done any hand quilting, but this little project seemed like the perfect chance to give it a shot with some perle cotton.